making: ROBYN'S FETISH CHALLENGE #250 "VALENTINE CARDS"
Good Morning to everyone!! Hope everyone is doing OK today. Sorry for no post last week. I do hope you read Robyn's Fetish Challenge Blog to find out the previous challenge. It's always posted there if you don't find it here. I only miss a post if something was going on in my personal life and there was. Nothing that I really want to tell to everyone like this. So I'm going to get to the challenge now and next week I'm sure I will have great things to tell. I can't believe that it is close to Valentine's Day already. Around here we just call it Hallmark Day. I don't need a special day to show my husband how much I love him. Imagine That!.... digis by Kris is our great sponsor for this week. Kris let me use her digital stamp called "Polar Love." This is a very cute image for Valentine's Day. There is a cute little bear and mouse under a mailbox with falling hearts. I just loved this image. Let me tell you what Kris will be giving as a prize for this week's challenge. I'm excited to show you the image that I used on my card. So, here it is. Isn't the image adorable. I did put my last name on the mail box. Not that my husband would know who this was from. I know it's a day that we do not celebrate, but this card goes perfect for the day. I love this stencil I used. All the hearts on it are wavy instead of just a straight line. I did use ink around the edges of the heart and the sentiment. I want to tell you all the items that I used to make this. There are a little bit more things used then normal. I know that's a lot of items but I only used a little of each one. I did have fun making this one. I wish it would have fit in my first sketch but this turned out really cute. I do hope that you will enter our challenge this week over at Robyn's Fetish Challenge Blog. I do admit these are fun cards to make and you will have a chance to win the prize. So, I hope that you have a Wonderful Sunday and a Great Week. 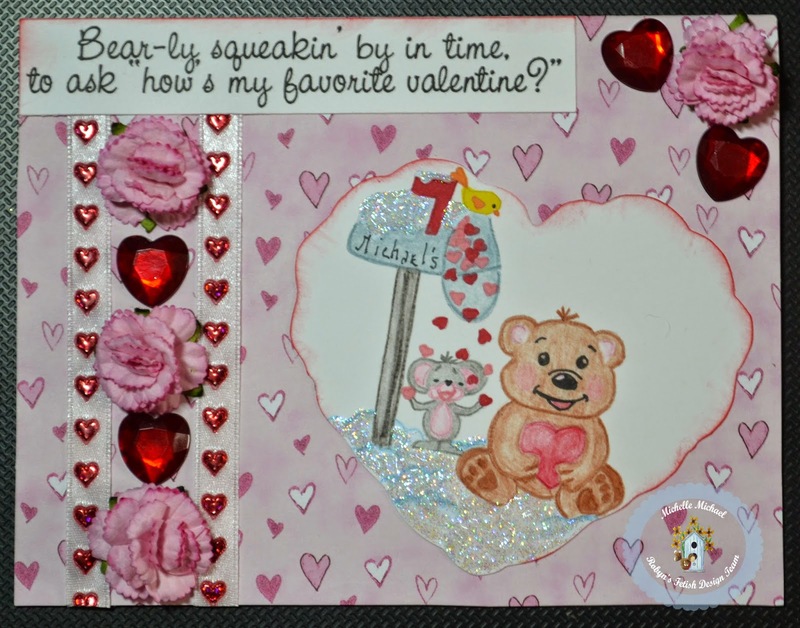 So pretty Michelle, love the roses and the design, wonderful DT inspiration for the Valentine challenge.